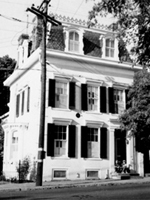 The Alexandria Library's Special Collections division has a wide range of resources available to help you investigate the history of your home. Using both primary and secondary sources, you can uncover information about past owners, property values, alterations and improvements, and perhaps even find a photograph or two. This list of resources is designed to help you get started on your research; it tells you the type of information you are likely to find in a resource and how that resource is organized. The sources in this guide focus primarily on Old Town Alexandria. In addition to the materials in this guide, the library holds several published works that focus on particular properties. Resources have been assembled on some of the better-known historical structures in Alexandria, and archaeological reports are available for other, lesser-known properties. A search of the library catalog for a particular address may turn up additional material. From 1791-1846, the area that is now the City of Alexandria and Arlington County (then known as Alexandria County) was a part of Washington, D.C. There may be information about your house or its owners in D.C. records. Areas that are now incorporated into the City of Alexandria were once part of Fairfax and Arlington Counties. There may also be material in the records of these two counties that will be useful to you. The current street numbering system in Alexandria was not instituted until 1888. If your house history research takes you back beyond this point, the houses will be numbered differently than they are now. The resources in this section can all be accessed by the address of the house, information that is likely to be available to the beginning researcher. These sources may lead to information about the owners of the property; dates when property was built, changed hands, or was altered; and the types of alterations that were done to the house. The earliest of the City Directories, which contain information about Alexandria residents and businesses, dates from 1791, and there is an almost continuous run of the directories from 1950 to 1980. Comparing information in the directories from year to year can lead to clues about the date a property was built. These resources can also be used to learn the function a property served, as well as the name of its owner. A useful feature appearing in editions from 1924 on is the crisscross directory, which is located in the back of each volume. This lists the properties by street, allowing the user to determine the name of the owner or resident of a particular address. Some of the earlier directories have only approximate addresses (e.g., Washington St. near Queen). Covering dates from the 1890s to the 1920s, these permits provide information about the types of changes that were made to the building, when the changes were made, and who made them. There is an index which lists permits both by the address of the property and by the name of the owner, so the permits can also be used to find the owner of a particular address. Permits for later dates can be found at the Alexandria Archives and Records Center. Built in America: Historic American Buildings Survey/Historic American Engineering Record 1933 - Present. 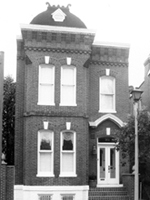 Part of the Library of Congress's American Memory project, this collection contains images of architectural drawings, photographs, and notes on several Alexandria properties. The collection can be searched by keyword or browsed by subject or location. This book is organized by street and contains photographs and descriptive information about a large number of historic Alexandria houses, often mentioning when a house was built and giving details about some of the owners. The book has information about both famous and lesser-known Alexandria houses. Cox's book is an excellent place to start your research. Although this book is rather old, it contains photographs of and information about several Alexandria houses and buildings, including some not found in Cox's book. By Philip M. Erickson, PhilipInformation about the first 1000 buildings in Alexandria to install running water. The permits cover the years 1852-1922, and although some of these permits date from before the change in the street numbering system, all of the properties are identified by their current street number. The properties are indexed in four ways: by owner, inhabitant, date, and address. Some entries have additional information describing the nature of the buildings on the properties. Of primary interest to the house hunter are Cox's notes and research for Historic Alexandria. These include information about the sources she consulted, correspondence, and drafts of the text of the book. Like the book, the series is arranged by street. The Cox collection also includes materials related to her work with the Historic Alexandria Foundation. With finding aid. 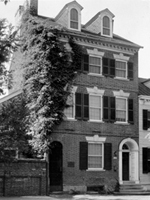 Architectural drawings are available for several of the better-known historic properties in Old Town, including Lloyd House, Carlyle House, the Lyceum, and Gadsby's Tavern. This map, which dates from before the change in the street numbering system, can be helpful in trying to identify the old-style address of a property. The houses and other buildings in this book are arranged by the names of the architects who built them. It is necessary to know either the name of the architect or the house's address, but the book gives good details about when the houses were built, the kinds of people who built them, and, sometimes, their owners. The different photograph collections contain many pictures of Alexandria buildings. Of special interest is the Cox Photograph Collection, which has prints of the photos used in Historic Alexandria. In the finding aid, photographs of buildings are grouped together by street. These permits, which cover the years 1936-1939, record the installation of running water in houses. They contain information about the owner of the house, the kind of house it was, what improvements were to be made, whether the house was old or new, and the name of the plumber who did the work. The permits are organized by street name, with all permits from the same street grouped together. Using information extracted from Fairfax County and Alexandria deeds and wills, this volume chronicles the histories of the lots into which the city of Alexandria was originally divided. The authors have provided maps to allow users to determine where the original lots were located. Helpful for tracing the names of owners and the dates on which land changed hands; less helpful for information about houses or other structures, which are not usually mentioned. These detailed maps of the City of Alexandria, which are at street level and show every building, are an excellent resource for determining approximate dates for the construction or demolition of a particular building, its function, and the materials that were used to construct it. The 1885 map uses the original street numbering system. Eight maps are on microfilm; the earliest dates from 1885, the most recent has updates to 1958. The map collection also includes the original of the 1931 map, which does not appear on the microfilm. Images of the documents related to a special property tax assessment conducted in the late 1960s and early 1970s to document over 6,000 structures in Old Town. The original records are held at the City of Alexandria Archives and Records Center.This project is funded by a grant awarded in 2001 by the Library of Virginia. The project will take three years to complete and properties will be added throughout duration of the project. Files of information relating to commonly-researched topics, including materials on neighborhoods, streets, and historic properties. Also, the vertical files contain information about the Historic Alexandria Foundation, including details about their House Plaque Program. A subject list for the vertical files is available at the reference desk. The materials in this section are most useful to researchers who have already worked with some of the sources in Part I, or who already have information about the owners of the houses they are researching. Most of these sources are arranged by the name of the property owner, making that information essential for researchers who intend to use these sources. Microfilm of the deed books, with the original name indexes. The deeds, which may include details about property boundaries or structures, are grouped by year. These assessments, organized by date, give the name of the owner, a description of the property, its location and value. There is no name index. These records give few details on the property or the buildings themselves, but they do provide information about the value of the property. An increase in value may mean that a new building was constructed or that other improvements were made. Records are grouped together by year and are then organized by the first letter of the owner’s surname. Although these records assess property value, they do not always provide the property’s location. Some records provide details about the use of the property. There is no index, and the records do not seem to be arranged in any particular order. Shows the value of tax assessments for houses and lots. The records are grouped by name, with surnames beginning with the same letter grouped together. These ledgers provide information about the value of houses and lots. The original indexes appear in the front of each ledger. These group the people according to surname, with names beginning with the same first letter grouped together. The value of each person’s property is assessed; while lots are mentioned, no details are given about buildings or houses. Organized by name; no index. These tax assessments sometimes indicate the location of the property being taxed. Some records also have details about extra taxes for houses with multiple stories, tavern licenses, etc. There is a name index at the beginning of the ledger. Microfilm of the original will books, grouped by date. The information varies from document to document, but a will may discuss the type of property willed, its location, or its value. Each volume has an individual name index, and there is a general name index covering the entire group of wills as well. The court has indexes and land records dating from the 1800s. Their web site has information on their hours and fees. Microfilm of the original indexes, which were divided into three groups: 1742-1797, 1797-1841, and 1842-1866. All three sections group surnames beginning with the same letter together; within this structure, the second and third sections group first names beginning with the same letter together as well. The original deeds are located at the Fairfax County Archives. Details about houses or property may be found in the personal papers of their owners. Once the name of the owner or the owner’s family is known, manuscript materials may be found that provide more information about a house. There is a subject index to the manuscript collections, and finding aids exist for many collections as well. These extracts from the deed books are indexed by name, subject and place, but not by street. They provide information about the general location of a property, when the deed was written, how much money was involved, and the names of the people involved. Fire insurance records containing information about the nature of the buildings insured and their value. There are both new policies and renewals, which means that multiple records may exist for the same property. The records, which include policies from the years 1796-1860, are arranged by the policyholder’s name and have been indexed. The library holds a small, incomplete collection of local telephone books that includes books from the 1970s, 1980s and 1990s. The telephone books are useful for tracking the more recent history of a building. These records describe the granting and transfer of deeds. They are indexed by name only and discuss the parties involved, the date, and the type of deed; they do not mention where the property in question is located. In order to identify information about a specific property, then, it would be necessary to know the name of one of the parties and the approximate date when a transaction may have taken place.